Fall is upon us and it’s time to open up our closets and embrace some warmer clothing. Depending on where you live, you might not need a full-length fake-fur coat, but it doesn’t hurt to check out your favorite celebrities for ideas. Celebrities are a useful barometer of what’s hot – and what’s not. Most of them have stylists who make sure their client always looks their best before they step out the door. People like Kim Kardashian don’t leave home without being styled by professionals. The wrong look can ruin their brand and cost them money. Most celebrities can afford to dress head to toe in designer. They love to rock Saint Laurent bags and Chloé backpacks. They might also be seen out and about wearing an Off-White hoodie while picking up a cup of frozen yogurt. Unless you are rich and famous, it is unrealistic to try and emulate your favorite celebrity’s look, but thankfully there are stores like SSENSE who stock all these famous brands, meaning you can now pick up cool Chloé bags, Gucci gear, and Balenciaga t-shirts and hoodies for less. Now that we have you dying to get your hands on the latest designer gear, let's look at which celebrity looks are rocking this fall. Read on for a few ideas on how to revamp your closet! Trench coats are very much in this season. Trench coats are perfect for the mild autumnal weather. You can weather the rain and wind with a tightly belted trench coat but not overheat if you need to pop into a few stores to pick up supplies. 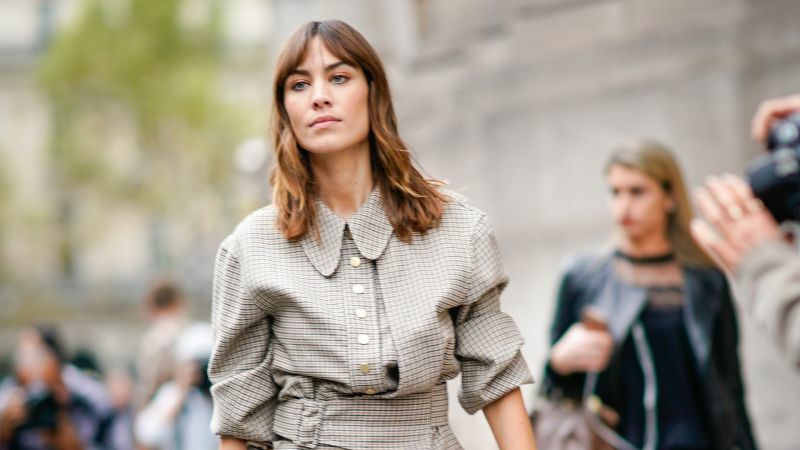 We spotted Alexa Chung wearing a simple beige trench coat at Paris Fashion Week. She wore it with a long maxi skirt in a bright pink pattern. This just goes to show that Trenchcoats are not just for private eyes on a surveillance mission. Wear your trench coat with a pair of skinny jeans, ankle boots and a knit sweater. It’s a great look for a casual date or dress-down day at the office. Continuing with the coat theme, we also spotted Hailey Baldwin wrapped up in a luxurious shearling coat and fluffy Gucci slippers. You might have expected Hailey to be all warm and cozy with her new husband, Justin Bieber, but no, she was all alone. Clearly, his love wasn’t enough to keep her warm that day so she chose a thick, super warm and cuddly coat to keep the chill away. Gigi Hadid is another celeb who loves the shearling coat look. She was spotted looking super warm and cozy wearing a shorter shearling coat. Gigi wore her jacket with very funky sunglasses. We love shearling coats. It’s the perfect coat for a cold fall day and we are definitely going to invest in one soon! We might just pass on the Gucci slippers though. Quite honestly, they didn’t look terribly practical! Victoria Beckham is the queen of roll neck sweaters. She wears them with skinny trousers, baggy trousers, tailored skirts, and loose pinafores. This just proves that roll neck sweaters are the ultimate in versatile dressing for changeable fall weather. Thin roll neck sweaters in autumnal shades such as cherry red, yellow ochre, and burnt sienna are perfect for a cool, crisp day. If you want to keep it classy, stick to black or white sweaters, which can be paired with any other shade under the sun. Thick roll neck sweaters are cozy and guaranteed to keep you warm on a bitingly cold day. Wear your thick roll neck sweater as an outer garment or throw a thin coat over the top. Thick sweaters look great with skinny jeans and stylish ankle boots. We recently spotted Gigi Hadid wearing a cute cream roll neck sweater with a funky striped coat. She pulled up the roll neck to cover the lower half of her face, so all we could see were her designer shades. It was a great look! There are days when it’s not quite cold enough for a coat, but you don’t feel warm enough in a sweater. These are the days when a stylish gilet comes in handy. Olivia Palermo was recently photographed wearing a lovely black military-style fluffy gilet. She paired with it military-style trousers and designer sunglasses. It was a great look for a damp, miserable fall day. You can copy her look, but pair your gilet with a pair of leather jeans or even a boho maxi dress and floppy hat. Add a pair of leather boots and your look is complete. Finally, if you need a more casual look, you can’t go wrong with a traditional parka. Kate Bosworth rocks this look with aplomb and so can you. It’s the perfect coat for a cool fall day.